6 So What Are We Looking At? 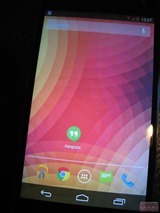 The home screen shot shows a familiar 4.2 stock wallpaper, Google Search widget, and some atypical icons for typical Google apps including Hangouts, Play Music, Chrome, Messaging, and Phone. There's honestly not too much to talk about here except the translucent dock and redesigned icons, all of which are flat except for hard, angular shadows which look at least a little bit in line with Google's visual asset guidelines. That said, they just don't seem particularly Googly. The Play Music icon looks similar to its current design (featuring criss-crossing gradients common in Play imagery), but like the other icons is significantly flatter. 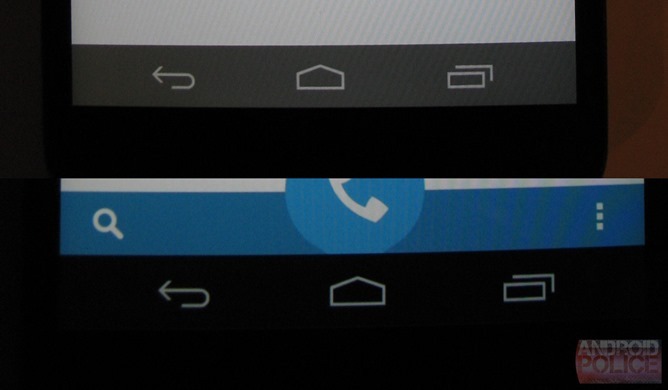 The Chrome icon is totally flattened out, the Phone icon is likewise flat save for a two-tone palette to preserve depth, and the Messaging icon has problems of its own. Chiefly, it's completely unbalanced. The visual weight of the point on the word bubble is absolutely miniscule compared to the massive bubble itself, which is occupied by two and a half white lines and a substantial expanse of blank space. Oh, and there's a substantially more cartoony and spaced-out app drawer icon. The status bar also has red icons for some reason. Presumably, this is meant to match the wallpaper, but the decision to keep a solid (or nearly solid) status bar with red (or transparent?) icons along with a translucent nav bar with white icons is questionable. It's also worth noting that in the video we saw the other day, the status icons were white, though the phone in the video sported the same wallpaper, and was also plugged in. 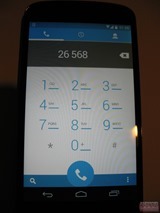 Next up is the Dialer app. There isn't much to point to on this screen that would immediately raise suspicion – most of the design choices here are actually plausible. 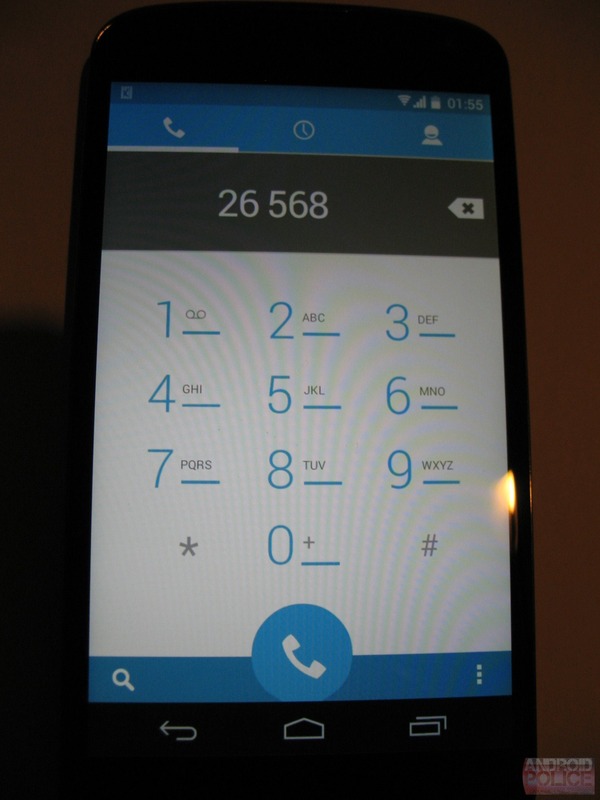 The magnifying glass icon is tweaked from its current state (with a less-pronounced handle), but the phone, clock, and people icons are consistent, as is number placement. What makes me suspicious about this screen, though, is how its status bar and nav bar compare to the other screens, specifically Messaging. In the dialer app, we see a solid black nav bar and translucent black status bar over a blue background to match the app's own palette. 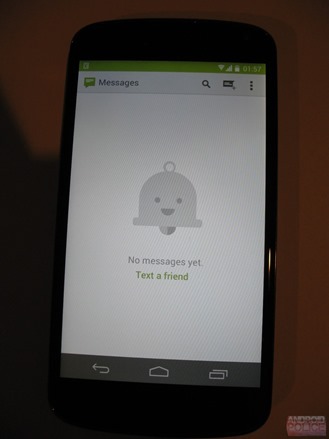 In the messaging app, the nav bar is translucent and the status bar is opaque green to match the rest of the app. While my personal design opinion may be immaterial in this case, I can't help but doubt that Google would implement a color- and transparency-changing status bar that's so inconsistent. Nor do I think that a translucent nav bar makes sense in an app with vertically scrolling content – if content isn't blocked from scrolling behind the nav bar, it makes a total mess, and if it is, the status bar is basically just gray tinted with whatever color is in the background of the app itself. Google Keep does have a transparent action bar, but I think we can trust Google to keep basic system navigation cohesive. Speaking of the Messaging app, notice anything familiar? 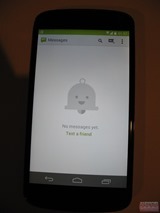 Yes, the one and only Mr. Jingles makes a cameo in the Messaging app in the alleged 4.4 photos. Why would he be in the Messaging app? That's a good question. Jingles is a creation of the Google+ team, so it seems very unlikely that he'd wander into an Android system app. In his own words, Mr. Jingles is "the G+ Notifications 'mascot'." Besides that, this app contains the same general iconography of Android 4.3, but action bar icons seem a bit bolder, and – again – the magnifying glass is just a stick, without the defined grip it sports currently. The About Device screen gives us a flat Settings icon, which isn't too surprising. 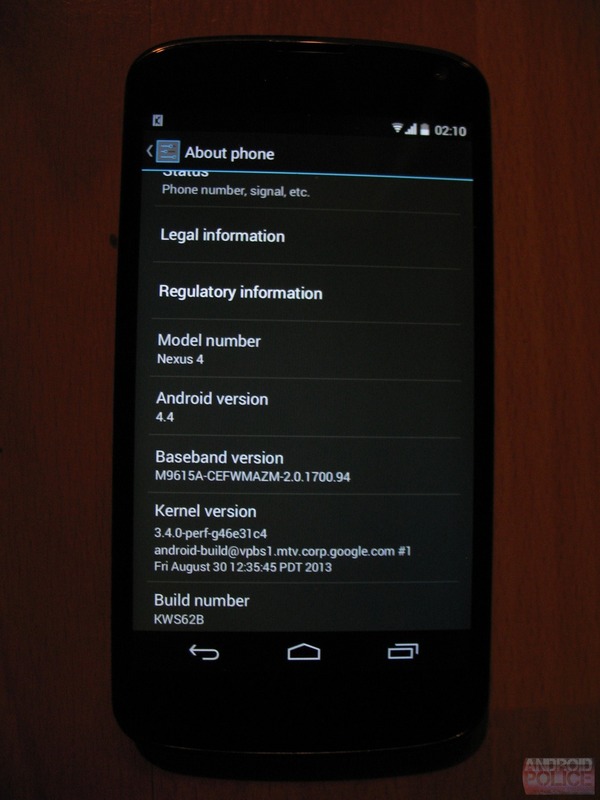 We also have the usual lineup – Model number (Nexus 4), Android Version (4.4), Baseband, Kernel version, and Build number. Of this information, I can only definitively comment that the build number does in fact align with a real date – August 31st. The Kernel was supposedly built August 30th, so those two items seem to align. This information isn't hard to fake, but it's also not the most apparently suspicious element of the photos. There are a couple of other small points that seem fishy. Chief among them is the status bar (again). 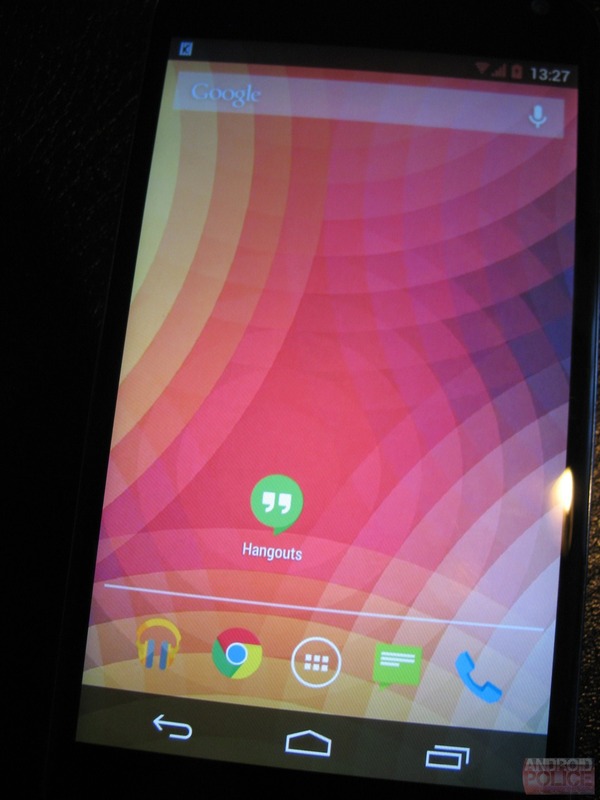 The other day, we saw a Keyboard screenshot with what we think are the white icons of Android 4.4, plus a Key Lime Pie debugging icon. 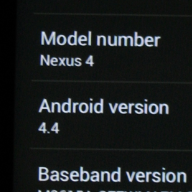 The shots we saw today have a totally different (narrow) WiFi icon, and a KitKat debug icon that consists of an uninspired four bars and a K. You might notice that the Nexus 4 in these shots is not plugged in. When asked, the tipster either evaded requests to pull down the status bar or to specify whether the device was debugging wirelessly, so we can't exactly explain the icon. The K icon being a debugging indicator would be, as one reader points out, suspicious since the KitKat name was announced September 3rd and the keyboard screenshot was published on the 20th, while the build running on this phone was supposedly built August 30th. We haven't seen anything that actually looks like a phone signal icon yet, so no definitive comment can be made on that front. A back button that isn't missing two pixels where the point meets the rest of the icon … Just kidding, Google has probably fixed this in KitKat (I hope). It's hard to say. When pressed for more answers, our tipster quit responding. Our guesses range from full-screen mockups to some sort of custom ROM, but what we're really seeing is unknowable without further input from the tipster. Whatever the case, we're pretty sure these aren't real. David learned his lesson the last time he made a definitive statement about the next iteration of Android, even if that lesson was delicious. Having witnessed that, I have to say I'm a little wary of closing the book on this one so early. That said, I am almost certain these aren't the real thing. If I am wrong and all of these screens reflect real features of Android 4.4 (unpredictable technicolor status icons, inconsistent navigation, random K icon, Jingles in Messaging, AND completely flat system icons), I think it's fair to expect some kind of consequence. Smashing a KitKat into my face doesn't seem very compelling, so I was thinking maybe something more interesting. I welcome ideas in the comments. Either way, we (hopefully) shouldn't have too long to wait before seeing the real deal.